When we think of French goat cheese, we reminisce about the open air markets where small, delicately ripened Crottins de Chavignol are on display. An American line of French-style ripened goat cheeses would not be complete without a small Bijou-like Crottin. 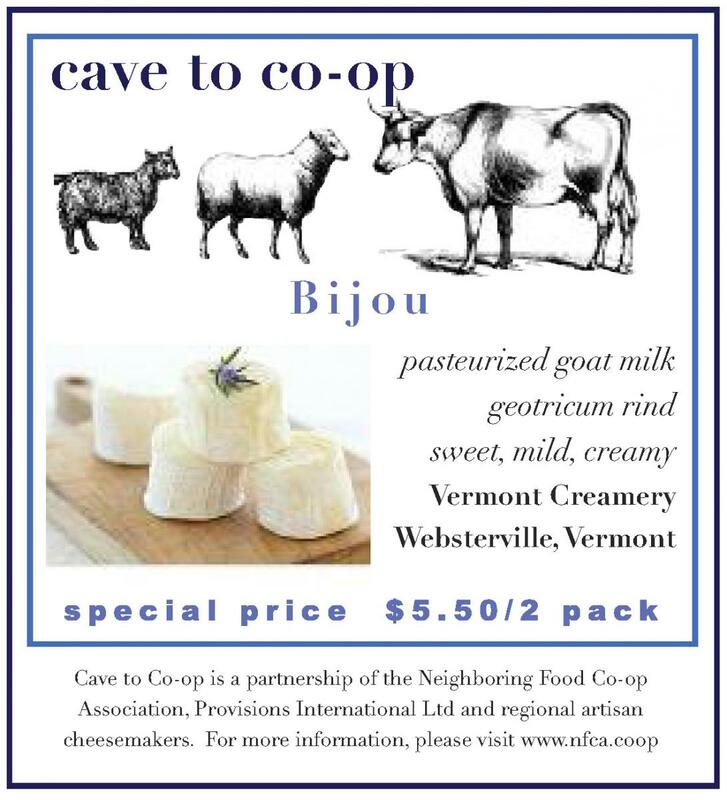 Bijou is French for jewel and this cheese epitomizes all that is special about goats and goats’ milk, and the making and caring for a small cheese. Bijou is made from pasteurized milk. After 24 hours of maturation/coagulation, the fragile curd is transferred into cheesecloth to drain overnight. The next day, the Bijou are hand-shaped and moved into a drying room. After a day of drying, the cheeses move to the aging room where the natural rind will grow in a controlled environment for about 10 days. When wrapped in its wooden crate, the cheese is still fresh with a delicate rind. As it ages, the interior becomes soft and the flavor more robust. Vermont Creamery was started by two young visionaries devoted to new and non-traditional agriculture, Allison Hooper and Bob Reese. As a college student, Allison spent a summer traveling in France. She worked on a small family farm in Brittany, earning room and board while learning cheesemaking. Bob always thought he would one day take over his grandparents’ dairy farm. A quarter century ago, a small savings and a $4,000 loan from an ag-minded Vermont church made their first nervous debut of fresh chèvre in the milk house on the farm in Brookfield possible. They sold first at farmers’ markets, then to food co-ops and French chefs. Today, they have won more than 100 national and international awards! Preheat the oven to 400 degrees. Line a large baking sheet with parchment paper or a silicone liner. Combine the flour, baking powder and salt in the bowl of a food processor; pulse to blend. Distribute the cubes of butter around the bowl and pulse until the butter is the size of peas. Add the crumbled Bijou and process briefly to distribute it evenly. Add the salmon and chives; pulse briefly to combine. Add the half-and-half and process just until the mixture comes together. Lightly flour a work surface. Transfer the dough to the surface and pat it into a disk; use a rolling pin to gently create an even thickness of 3/4 inch. Use a small round cookie cutter to form 18 small (1 1/2 to 2-inch) scones, re-rolling the scraps as needed. Then arrange the scones on the baking sheet, spaced at least 1 inch apart. Brush the tops of the scones with the egg wash. Bake for about 15 minutes, until lightly browned. Transfer to a wire rack to cool slightly before serving. Cut the Bijou in pieces and add to milk and cream with salt and pepper, and warm in a saucepot, but not to the point of boiling. Put aside. In a bowl, put the egg yolks and whole eggs, mix together, then add a pinch of salt and pepper and the chopped fresh thyme. Carefully combine both mixtures and then slowly mix together using a hand blender. Season to taste. Pour the custard into crème brûlée containers and bake in the oven in a water bath at 275°F for 30 minutes until firm. Let cool, and then just before serving, burn with raw sugar under the broiler or with a torch. Syrup: Dice rhubarb and strawberries and put in a pot with sugar, vanilla, and lemon juice. Cook for 10 minutes until it has a compote thick consistency. Cool and serve at room temperature as a quenelle (teaspoon) on top of the crème brûlée. Copyright © 2010 Vermont Butter & Cheese Creamery. Pat dry and toss leeks with a splash of olive oil and season with salt and pepper. Broil in the oven for about 5 minutes until tender but not mushy! Let the leeks cool, then chop thinly and put in a medium-size bowl. Prepare the dressing. Mix together the mustard, vinegar, olive oil, and leeks, and let sit for 4 hours to 1 week. Put a medallion of the Bijou, rind facing up, on each baguette piece and place under the broiler until the cheese is soft to a little runny. The rind should be slightly golden (about 2 to 3 minutes). Serve immediately over mixed greens tossed in the leek vinaigrette and the tomatoes. Preheat oven to 400 degrees. In a wide, shallow dish combine 1 cup brown sugar, 1/2 cup roughly ground almonds or pecans, 2 teaspoons dry mustard, 1 1/2 tablespoons of coarse ground pepper, 1 teaspoon kosher salt, 1/3 cup mustard seeds. Separate 2 pounds of bacon into strips. Dip and press each slice into the sugar mixture on both sides. Lay bacon strips on a large, rimmed baking sheet covered with parchment. Sprinkle excess sugar mixture over the bacon slices in the pan. Roast the bacon until fat begins to render, about 6 minutes. Rotate the pan front-to-back and continue roasting until the bacon is crisp and brown, 8 minutes. Cool; cut bacon into bite-sized pieces.